St. George's Day Party Packs make choosing so easy. Find a pack that is right for you and have all of the St. George's party products you need. 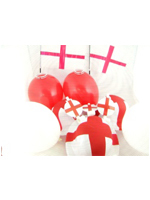 If you cannot decide between an England decoration pack or a supporters pack an England combined pack will be perfect. Please call our team on 08453 31 34 31 for any advice on St. George's Day decoration packs.